When it comes to garage storage and organization, the choices for storage bins seem endless. Walk into almost any store, from your local big names to the quaint hardware store on the corner, and you’ll find storage bins of all shapes, sizes, and prices. How do you know what to choose? Which will hold up the best? Which stack easily and securely? Which latch and which help keep out moisture? Never fear. We’ve evaluated dozens of brands for strength, ease of use, stackability, affordability, and quality. Our favorite overall is the Sterilite model 19859806. It’s a 30 quart/28 liter clear box with a latched lid. And if 30 quarts is too small for your needs, there is a 70 quart version (model 19889804) of this style which rates very highly also. We love the fact that they are made in the USA also. Durable, dependable, reusable storage containers should be easy enough to find. But once you start looking, you realize there are hundreds of choices. Different materials, different lids, different handles. Where do you start? Do you need a bin that’s weather proof? Do you need a bin that you can see the contents through? Is it for toys, or greasy ugly tools? Do you need to keep mementos and cherished memories safe from dust and moisture? Will you be moving the boxes often? Do you need to lift them high up over your head? How heavy will they be? These are all questions you need to consider. Once you figure out what your storage needs are, it’s easier to find a starting point for your search. We’ve taken some of the guesswork out of it for you and have our recommendations. For the price, nothing beats our top pick. The Sterilite 30 quart storage bin is consistently highly rated by consumers for durability. The bins easily stack on top of each other when full, and stack quickly inside of each other when empty. The clear plastic allows items inside to be easily identified. Latches quickly secure the lid in place. The 30 quart size is easy to grip and unless you’re storing bricks, it’s easy to pick up and place high on storage shelves. Not only are these great for garage storage, but because items inside can easily be seen, they are wonderful for storing toys and games in the playroom or kid’s bedroom. They are a breeze to wipe clean with soap and water, should you need to remove grease or sticky finger prints. Because of the latching lid, these boxes cannot be over-stuffed. But once that lid is secure, it’s there to stay. The lid won’t bulge and pop off under pressure, like with some of the lesser quality containers we tested. And keep in mind, for bigger items, there is a 70 quart (17,5 gallon) bin from Sterilite that has all of the same attractive features. They also stack nicely and help organize any area quickly. They are more affordable than their counterparts, and we love the see-through material. A friend of mine actually uses her 70 quart size Sterilite as a bathtub to give her dog baths outside during nice weather. They are that durable! Ziploc has come onto the market with high quality, durable, and affordable storage boxes. Well-known for their sandwich bags, the brand has been successful in expanding their storage horizons. These boxes are actually made by the company Iris, right here in the USA. Iris has been in the storage-bin business for a long time. Boxes carrying the Iris name are generally priced higher than an equal counterpart, but with the addition of the Ziploc line, the price has come down a bit and it is a great value. However, Ziploc boxes are still generally more in price than Sterilite. What we love about the Ziploc boxes is how secure they are. There are SIX different latches to lock the lid to the box. The touted “weather shield” lives up to it’s name. Consumers rave about the contents in the bins remaining dry, even when left in the dampest of garages and basements. There is an entire line of Ziploc WeatherShield bins, in sizes for just about every purpose you could dream of. Most latches hold a lid on and keep contents in. These latches go one step further and keep moisture and dust out. As with the Sterilite boxes, these boxes cannot be over-packed, due to the latching lid. This ensures a flat, even surface that is great for stacking. If your items are precious to you, or could be damaged by moisture, then the extra cost is justified and the Ziploc bins are our recommended choice. These totes cast bang for the buck out the window to make room for security. The totes are extra thick and solid with provisions for locking with devices such as pad locks or cable locks. The downside to the locking feature is that you will need four separate locks, one for each corner, to fully secure the tote. The lid does include a rubber seal providing a small degree of weather resistance. I wouldn’t submerge the totes but I would fee safe storing them in a humid environment or tugging them along in the bed of a truck. Overall, if you’re looking for privacy or security these totes are hard to beat. The storage containers in Rubbermaid’s Roughneck line are decent, hardworking boxes. They are durable, and we have some in our garage right now that have been there for 15 years, and still get the job done. That being said, the boxes don’t hold their shape very well. The lids do not stay on tightly, and we’ve had the lids pop up and open just from sliding the boxes from one side of the shelf to the other. Since the boxes are opaque, you can’t easily identify the contents without thorough labeling. But sometimes we don’t want to see junk that we pile inside of storage containers, and we use containers to purposely hide ugly garage items. In that case, these bins are a good choice. The built in handles are comfortable and sturdy, making these easy to lug around. If you’re not overly concerned with a tight fitting lid, or need to see the contents, then the Rubbermaid Roughneck is a tough and dependable box. It gets the job done, but with an improved lid it could be a lot better. The solid material does withstand drops and bumps much better than the clear boxes in the top two positions of this article. It has more flex to it, and it takes a lot to crack it. The Rubbermaid company boasts a 10 year limited warranty on their Roughneck bins. With so many boxes to choose from, it’s easy to become overwhelmed. Stay focused on the goal: organizing your space and storing your goods. 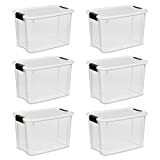 Then get your hands on several of our top rated Sterilite storage boxes, and get to work freeing yourself from the clutter that has gathered throughout the long winter months.